George Lucas has been granting all kinds of wishes to Star Wars fans these days: not only did he retcon the concept of Jedi singlehood, last Friday he owned up to the conversational shortcomings of his most successful series of films. But Lucas didn’t confess to just anyone: he chatted with fellow bearded man and self-proclaimed “original Star Wars fan” Stephen Colbert as part of the Tribeca Film Festival’s Tribeca Talks: Directors Series. The pair’s conversation hit upon several of Lucas’ career highlights and missteps, most of which are concentrated within the aforementioned franchise. 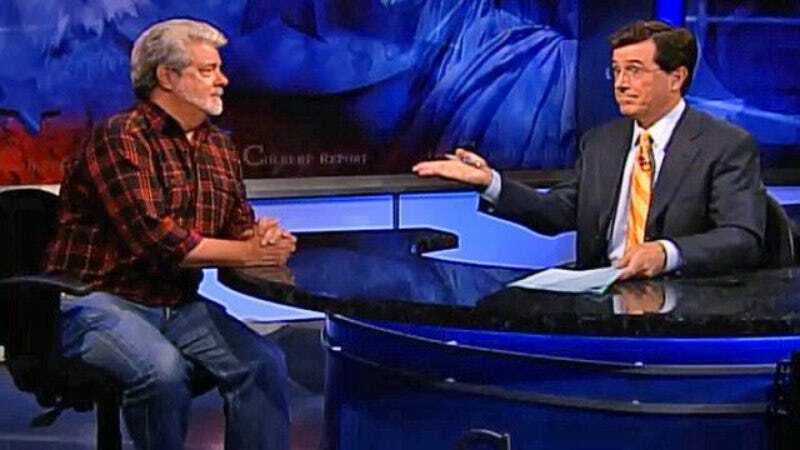 When the director referred to those films’ dialogue as “wooden,” Colbert helpfully suggested that it was just “hand-crafted,” thereby reminding us all of Lucas’ auteur status. But none of that really matters, because, according to Lucas, all a movie needs to be great is good picture and sound—plot and dialogue are secondary concerns. By all accounts, Colbert conducted a pretty straightforward interview, demurring when audience members tried to switch the focus to him, probably because he hasn’t been up to much lately. Lucas, on the other hand, has been too busy to even watch The Force Awakens trailer, though he hears good things.